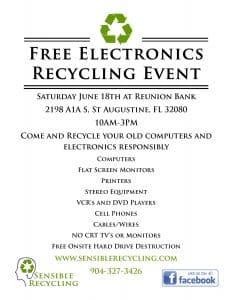 Sensible Recycling will be hosting our first electronics recycling event on Saturday, June 18th and Reunion Bank in St. Augustine Beach, Florida. Please come out and bring your old computer and electronics so we can recycle them properly. We are also providing free on-site hard drive destruction to help keep your data safe and secure. If you have any questions, please give us a call at 904-327-3426 or contact us. Thanks!